I redid our master closet a couple of years ago when my husband bought me wooden hangers for my birthday. (Don’t worry, he’s not a bad gift giver, this is actually exactly what I asked for and they made me very happy. I have issues I know). I still have plans to really take our closet to the next level with some built-ins but we’re not there yet. 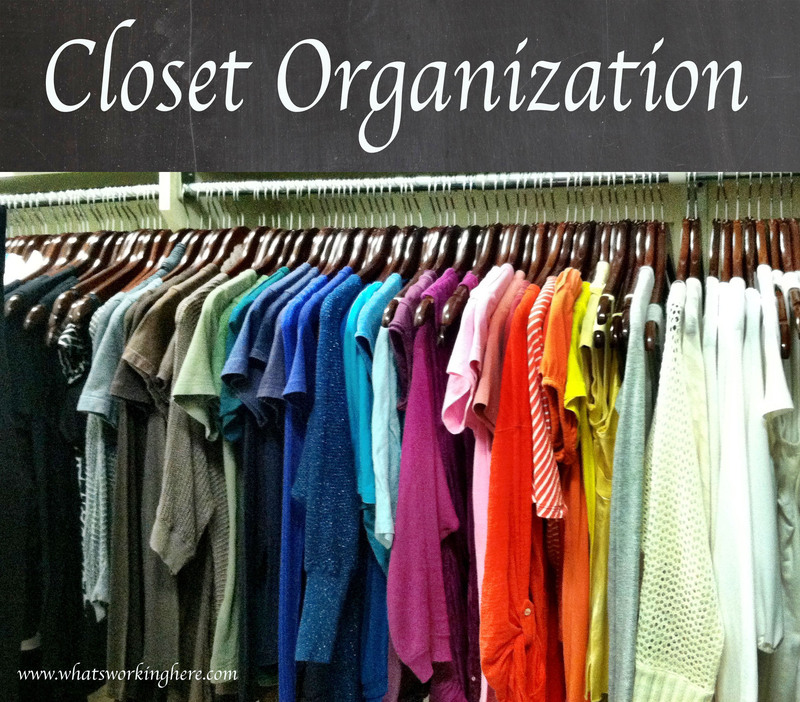 There are a couple of different ways to organize your closet. I tend to change it up from time to time. I’ve got a mixture of these going at the moment. Outfit Grouping– when I feel like I’m wearing the same thing over and over I’ll create outfits and hang my clothes up by outfit then wear them from front to back. When hanging up clean laundry I’ll take pieces that are still hanging and use them first to create new outfits then fill in with the clean clothes. I’ve got my husband’s workout clothes and shoes stored in this section of shelving. I used fabric bins from Target to separate the space. Workout Shirts (sleeved/tanks) are on the top row, Shorts in the middle and pants on the third row. Under this shelf we have a small round hamper to collect dry cleaning and wire hangers. I also used fabric bins up on the closet shelf to store his sweats and swim suits. His ties and belts are organized on a rotating tie organizer. After seven years we just had to replace it. All of his work clothes are in this section, sorted by type then color. Under the hanging clothes I used a shoe organizer for his work shoes. His regular clothes hang on the opposite wall. Shirts up top (polos by color, then other shirts by color, followed by button up shirts by color). T-shirts and shorts on the bottom. Moving to my side of the closet. I added a pre-made shelf from Lowes to stack sweaters on. I added another shelf underneath to stack jeans. Below the jeans my shorts and skirts hang by color. I use the pole section above to drape scarves. My tops hang by color. Followed by button up shirts by color, then pants, dresses and suit jackets. Above my hanging clothes I have fabric bins for sport bras, work out shorts, sweat pants, pajama pants, swim suits and cover-ups. Sport shirts hang by team. Below, t-shirts and sweatshirts are hung by color. This part of the closet is also where we keep our 3-section laundry hamper (whites, darks, lights). I have a nice built in shelf for my shoes, arranged by type and color. At the bottom of my shoe shelf is a fabric bin to collect donation items. That’s our closet. I have visions of adding drawers to the bottom of the hanging areas and making it a one stop place for everything we need to get dressed. Follow me on Pinterest for more closet ideas. We can dream together.